Berney, a wild boar orphan piglet, is an exceptional ambassador for Leilani Farm Sanctuary on farm tours because he is sweet, shy and gentle -- helping to dispel the myth that wild boars are inherently vicious and mean. As the wild pig population has grown in Hawaii and led to the destruction of forests and crops, efforts to eradicate these animals have also increased. A humane alternative for protecting farms and natural ecosystems is the installation of fencing. Sadly, many of the methods commonly employed to reduce the population of pigs are inhumane. Hunters use dogs, bows and arrows, and knives to kill the pigs. 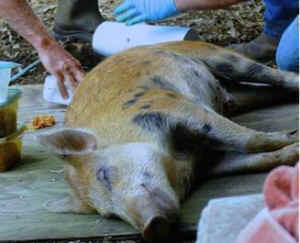 Snares, in which the pigs are caught and eventually die, are cruel and indiscriminate, often killing unintended victims. 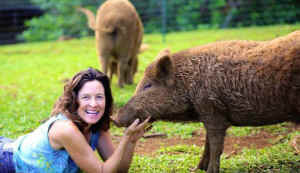 Pigs were first introduced to the Hawaiian Islands by the ancient Polynesians around 300-500 AD. Over time, these pigs became feral and multiplied in the wild. 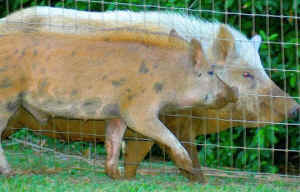 With the arrival of Europeans in the late 1700’s, domesticated pigs entered the islands and interbred with the Polynesian breeds. As the wild pig population has grown in Hawaii and led to the destruction of forests and crops, efforts to eradicate these animals have also increased. A humane alternative for protecting farms and natural ecosystems is the installation of fencing. Sadly, many of the methods commonly employed to reduce the population of pigs are inhumane. Hunters use dogs, bows and arrows, and knives to kill the pigs. Snares, in which the pigs are caught and eventually die, are cruel and indiscriminate, often killing unintended victims. 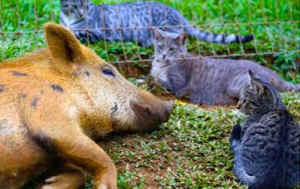 Berney’s life at Leilani Farm Sanctuary all began one quiet evening when the little feral piglet innocently wandered up from the gulch and made friends with the rescued animals inside the paddock. Night after night, Berney returned to flirt with our resident female pig, Kea, engaging in animated conversations of oinks, grunts, and snorts. Berney was also fond of the donkeys and goats and would follow them along the fence line. It was clear that this pig really wanted to join the Sanctuary ohana. Berney’s mother was more than likely killed by hunting dogs or firearms, rendering him an orphan. To prevent his meeting that same fate, we decided to adopt him. Time was of the essence, as we wanted to neuter him while he was young. After the veterinarian completed the surgery, Berney awoke from anesthesia inside the Sanctuary, surrounded by his new friends. He was a pig in hog heaven! Berney quickly learned his name and ran toward us when we called him. Pigs are highly intelligent, with cognitive abilities equal to a 3-year old human’s. 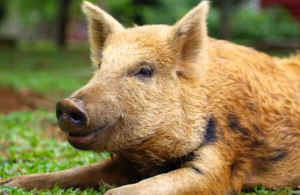 Today, Berney eagerly approaches us for affection: belly rubs, kind words, and kisses on the snout. This wild boar is the gentlest pig on the farm and a favorite of many who meet him. Often their perspectives about pigs, food, and hunting evolve after meeting Berney.